The poor seldom obtain the financial services most of us take for granted. If they do, the markups are off the charts; they are trapped in an endless loop of financial misery almost impossible to escape. Pay higher rates for loans. Are forced to go to pawnshops and accept steep discounts on their possessions in exchange for credit. Go to check-cashing services and cash checks at steep discounts to their face value. Pay high fees on money orders. Pay cash for everything, while most take advantage of interest-free loans on credit cards. Regulation plays a role in the cycle of poverty. Due to fear of the unknown, banks are required to hold more reserves for loans that are considered “low quality.” Banks view the poor as too risky and unprofitable to service. The United States is considered to be the world leader in FinTech. Disturbing things occur in the dark underbelly of our technological prowess. 7.7% of our population is “unbanked.” They have no bank accounts. 17.9% are deemed “underbanked.” These individuals rely on things like payday loans which charge exorbitant interest rates. In Detroit and Miami, an astounding 20% of inhabitants are unbanked. In the developing world, the problem is much, much worse. 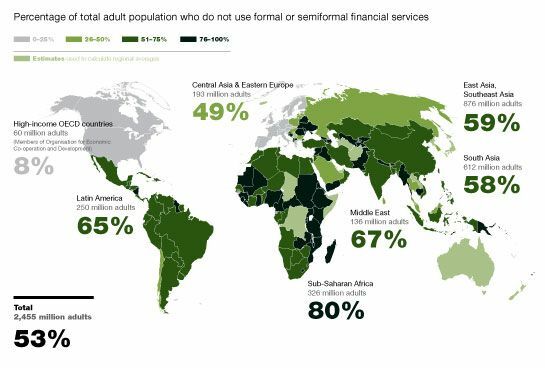 According to the World Bank, two billion adults worldwide are considered to be in the “unbanked” category. Imagine if we could somehow make a dent in this problem? Cutting these numbers by a small amount would dramatically change things for the better. Even those insensitive to other’s suffering should take notice. The “greed is good” crowd would be consoled by a likely surge in stock prices. Poor people can’t provide information about their identity due to a myriad of factors. Income earned off the books, lack of a driver’s license, and nomadic residency are just some of the issues that segregate the poor from modern finance. The problem is worse in developed nations where the state of record keeping is often in shambles. Many agonize over identity theft and social media companies capturing personal info and selling it to the highest bidder. On the bright side, the unbanked have no worries here. They have no financial identity to steal.